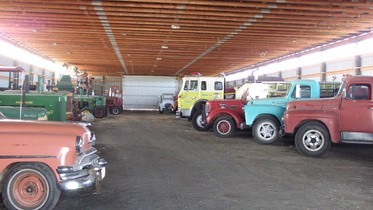 The former Toby Kaziel Pavilion was slated to be demolished by the Town of Stony Plain due to structural problems that would not allow it to be renovated into a four season building. An agreement was made between the Town and the museum to take down the building and clear the space and that the building would be moved the 600 yards (545m) to the museum grounds. Thanks to the Town of Stony Plain, some generous sponsors, and our volunteers, we were able to do this and now have a 60ft by 200ft (18m x 60m) display building for large machinery and vehicles. 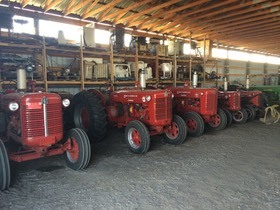 This will allow us to keep large artifacts out of the sunshine, which deteriorates the rubber tires, and the snow and rain rusts the metal parts and rots the wood. 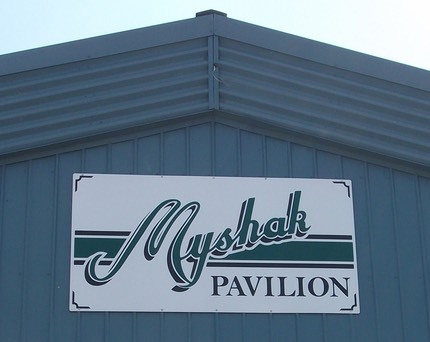 Some of the extra material was used to build the Restoration shop and the rest will be used to put a roof over the sawmill.In 2012 the building was rededicated as the Myshak Pavilion in appreciation for the generous donations that this local family run company has provided to the Museum.